A bill to revoke Imperial Decree and make provisions about Pavlovian and Lostislandic nationals. ARTICLE I. We are pleased to announce that, in respect with the actions of Mr. Yaroslav Mar, in the conduct of the defense of the interests of the micronations with Antarctic possessions against the fraud of the Mr. Alexey Palkin, We understand that it is the most correct, like Mr. Mar, to act with greatness and therefore, We revoke the banishment of citizens from Pavlov and Lostisland, assuring them, once again, if they wish, free access to the Empire and its dependencies. a. His Serene Highness, Thomas, Prince Karácsony-Maryen. b. His Royal Highness, Ulli, Duke of Daugavia. c. His Grace, Raphael, Count of Goyana. d. Her Royal Majesty, Marina, Queen of Manso. e. Mr. Igor Oliveira Barros. g. His Imperial Majesty, Leonardo, Emperor of Villa Alicia. h. His Imperial Majesty, Vitor, Kaizer of Deltaria. i. His Grace, Heinrich wo Krüscickt, Marquis of Sachzenhousen. j. Karl Gustav zu Litoměřice. Hofbau, 18 JANUARY 2O19. — His Imperial and Royal Majesty, the Emperor-King. 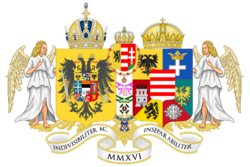 His Imperial and Royal Majesty, by the Grace of God, Emperor of Karnia and King of Ruthenia, King of Bessabia, King of Acrin, King of Horvatia, Szolnók, Geza, Letingia, Escandia, King of Jestia, etc. ; Archduke of Karnia, Grand Duke of Gaussland, Caledonia; Duke of Ladislavia, Hoheneinsamkeit, Weißeswasser, Csorna, Chedowski, Balaton; Grand Prince of Karcag, Margrave of Luftrein, Duke of Persenburg, Götzödorf, Mohács, Pannonhalm, Podenbrad, Gyalla, Oswiencin, Zallanta, Cieszpreg, Fertodin, Rugoz, Árpád; Princely Count of Bihar, Tamaz, Koberg, Gerizia, Grevenia; Prince of Thomaz-Rocha, Bersód; Margrave of Upper and Lower Lusitia; Count of Heves, Feldkirchenberg, Brevento, Szentes, etc. ; Lord of Fürstenbergserdboden, Kazin, etc., etc. etc.